Grange village was once a stronghold of the O’Harte and O’Connor families. The Annals of Ireland record that in 1604 a ‘new castle and 7 cottages were built by Hugh O’Hart in the town of Grange, Co. Sligo.’ In the 17th century the village belonged to the Cistercians of Boyle Abbey and remained so until the Dissolution of the monasteries. Long before that time the O’Hartes had been assigned the village by the O’Connor Sligoe at which time it was known as Grange Muintir Hart. The name Grange itself comes from the Irish Grainseach from a granary that once stood there. Grange, in common with the rest of the county, was shortly to be divided among the Cromwellians: the Temples (Lord Palmerston’s forbears), the Wynnes, the Gores to name but a few, many of whose descendants own large tracts of land to this day. In 1641, in an attempt to reclaim their lands and properties, the chiefs of Sligo, the O’Harts of Grange and the O’Connor Sligoe among them, took up arms in rebellion and attacked the English garrison at Sligo Castle. The soldiers surrendered and were given safe passage out of the county. Twenty settlers placed in Sligo jail for safety by the insurgents were killed there by a vengeful mob. In the long run nothing much changed and the settlers held on to their lands. residence in the village. They supervised the operation of the granary and the storage of food there pending transferral to Boyle. An Ordnance Survery map of 1837 shows a ‘Tuck Mill’ and mill race south of the present village. Correspondence of the Classiebawn estate indicates a flax scutching mill being built, ‘at the river above Grange’ in 1864. Six sets of scutching machines were being made at Belfast. The builders of the mill, finding a new wheel too expensive, were on the lookout for a second-hand water wheel. For more information on Grange we may be grateful to the Folklore Commision. Grange resident, John Gilmartin, 70 years old in 1937 related to Folklore collectors that in Penal Times (18th cent.) 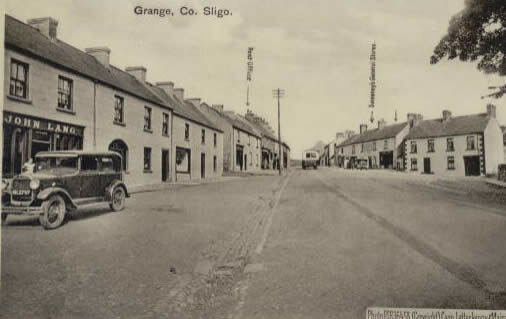 Grange consisted of a single row of houses on the southern end of where the village now stands. A double row of small daub huts stood on either side of the road to the south of this again. 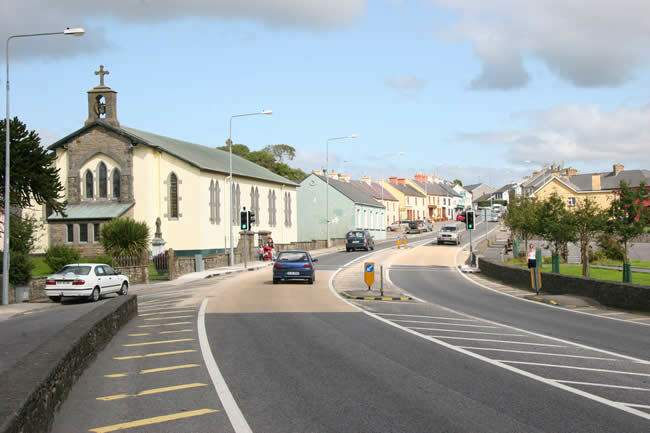 This, the village proper, was known as ‘Sráid Trá’. The huts of ‘Sráid Árd’ to the north were occupied by tradesmen: ‘shoemakers, weavers, patchers, wheelwrights, smiths, basketmakers, millers and coopers. In fact we may say that Grange was then much more of a hive of industry than it is today! Streedagh beach near the village of Grange today presents an idyllic picture of golden wave-lapped sands and peaceful waters. It wasn’t always so! The ‘Erin’s Hope’ dropped anchor here during the Rising of 1867. A man named Buckley had discharged weapons on board causing injury to members of the crew. The injured men were put ashore at Streedagh and were shortly discovered by the Coastguard who were stationed nearby. The men were brought before Ormsby-Jones at the district court, charged with treason, and sent to prison. Streedagh beach was often used as a departure area for raids by the R.I.C. on the poteen industry of nearby Inishmurray island. Constable Jeremiah Mee recalled in his memoirs a visit he made there in 1918. He and another constable were equipped with ‘long, pointed steel rods which were to be used for probing hay and corn stacks, and shingle along the strand, in our search for illicit stills’. He describes boarding a boat at Streedagh Point manned by ‘two hefty Mullaghmore fishermen’. Stáid Abbey: "the Church and images of the saints burned and completely ruined". The lichen encrusted gable of Stáid monastery stands today as a gaunt and elegant memorial to the monks and Spaniards whose lives ended so violently in this beautiful place. Is your village in Co. Sligo or have a Sligo connection? Let us know if you would you like to see it featured here.